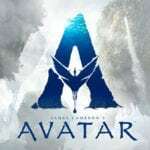 Starring Colin Farrell, Michael Keaton, Eva Green, Danny DeVito, Nico Parker, Alan Arkin, Finley Hobbins, Joseph Gatt, DeObia Oparei, Roshan Seth, Sharon Rooney, and Douglas Reith. A struggling circus are aghast to discover that their potential star attraction has been born with oversized ears, but little do they know that young Dumbo the elephant has an amazing gift, one that could save them, but put the pint-sized pachyderm in a world of danger. 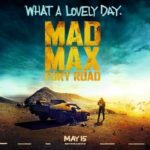 Rather than complain about Disney scraping the bottom of the creative barrel by churning out yet more of these live-action remakes, especially in the wake of the uninspired Beauty and the Beast, let’s instead concentrate on a small elephant diving into the bottom of one, with Tim Burton’s re-imagining of the 1941 animated classic. It’s that word right there that’s the key to Dumbo being such a delightful success; re-imagining. 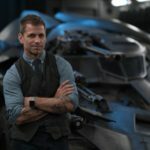 Running at just over an hour, the original is slight, so Ehren Kruger’s script needed to weave in different strands in order to flesh out the story to feature length. As a result, this feels like the first of the Disney live-action retreads that manages to untether itself from the 2D animated cell. Spreading its wings, or rather more appropriately ears, and becoming a film in its own right, rather than tracing around lines from the past. How it manages to achieve this may cause some disappointment amongst fans of the animated film. Not the decision to correctly ditch the problematic crows, but the choice to jettison Timothy Q. Mouse as the film’s heart. 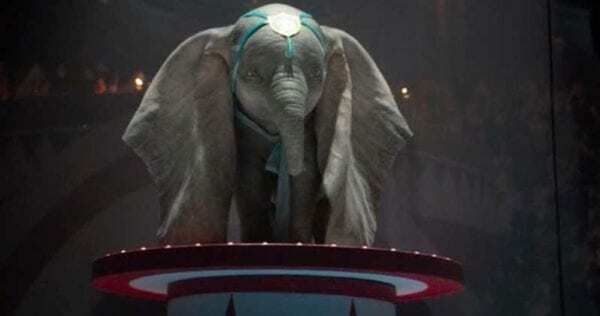 Don’t worry, he makes a fleeting appearance at the start, but his role as Dumbo’s voice is instead given to Nico Parker and Finley Hobbins, as two children whose parents worked at the circus during its heyday. What this means is that we never really get a feel of Dumbo as a character. The film seems to rely too heavily on our own memory echoes from the Disney classic, and the occasional look into his big sad eyes. 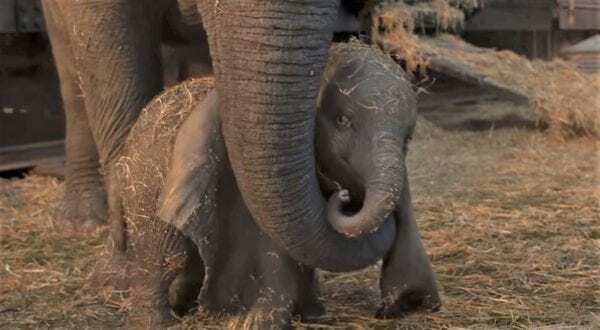 He’s a baby elephant, so he’s going to be intrinsically cute, but we never get an idea of anything approaching personality for the little fella. 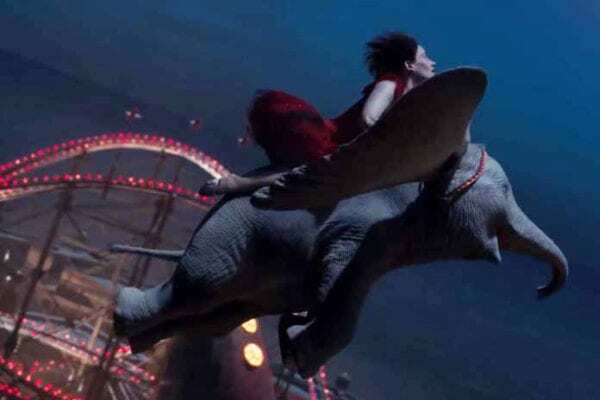 Instead it’s the human counterparts around which Dumbo flies who get the focus of the story. Farrell has nailed the role of struggling Disney patriarch in the likes of Saving Mr. Banks, and he’s on fine form here, as is Danny DeVito, relishing the chance to ham it up as circus impresario, Max Medici, who seems to be wearing the same getup he did in Tim Burton’s Big Fish, with which this shares a lovely worn-around-the-edges aesthetic. Throw in Michael Keaton, with able support from one of the best wigs of the last decade, who’s having great fun with his old Batman and Beetlejuice boss, with the villainous turn of the piece. Completing the mini reunion is Eva Green, resplendent as Dumbo’s performing partner, and a sad reminder that not enough people bothered to watch their last film together, Miss Peregrine’s Home for Peculiar Children. Shame on you. 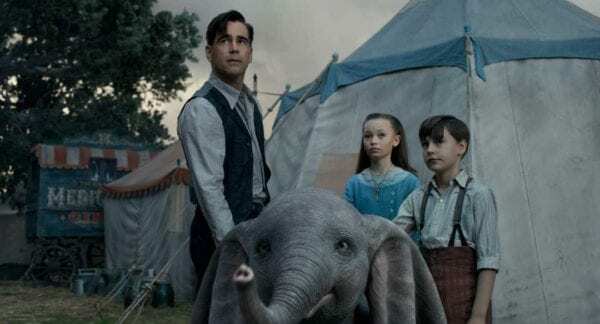 Dumbo is up there with Pinocchio when it comes to Disney’s darker fables, so the material is a perfect fit for Burton, and he strikes a nice balance between the remit of telling a children’s tale, and peering into the shadows. So we get some wonderful sun-dipped skies over the circus setting, a lovely interpretation of ‘Pink Elephants‘, during which Dumbo’s head nodding along will be hard pushed to be beaten for cutest moment of 2019, but we also visit Nightmare Island, where Burton’s predilection for the macabre can bear its teeth, and some very weird POV Dumbo-vision shots, which don’t always work. 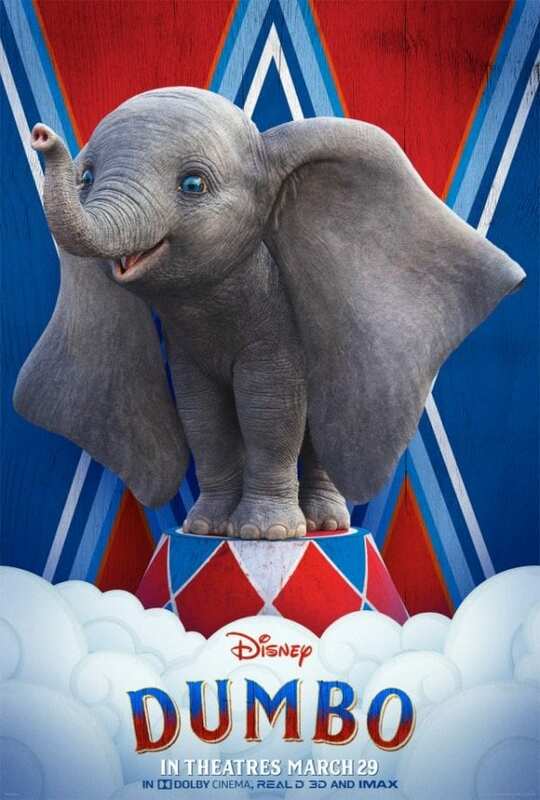 With a real old-fashioned matinee movie feel to proceedings, as well as some timely messages that’ll resonate with a modern audience (there’s no way Dumbo would survive a single day on Twitter), this is a heart-warming, eye-moistening piece of family entertainment.